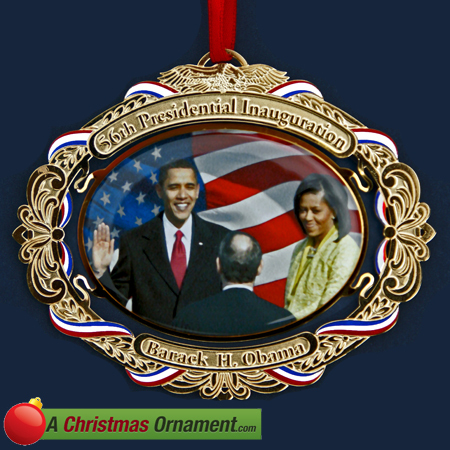 Christmas Ornaments Made in USA - Barack Obama 56th Inauguration Ornament - A Christmas Ornament Co. This ornament features President Barack Obama, standing steps of the U.S. Capitol along with Michelle by his side, being sworn in by Chief Justice John Roberts (with Michelle at his side) taken during the 56th U.S. Presidential Inauguration on January 20, 2009. The background is made up of the American flag billowing in the wind.